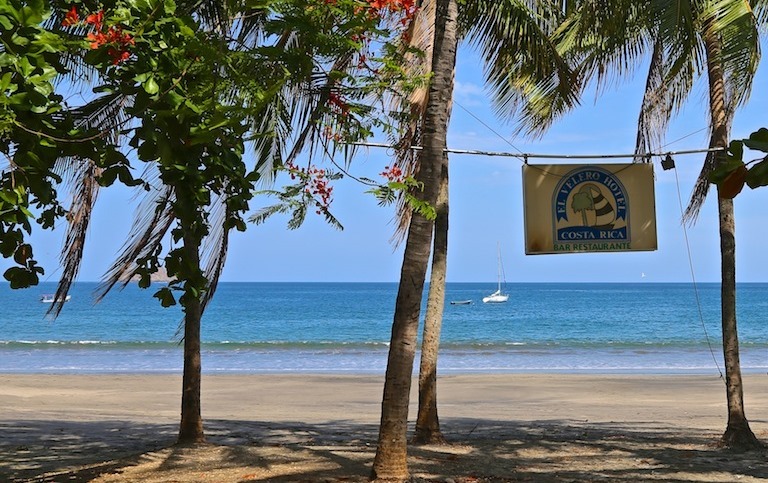 What is Playa Hermosa Guanacaste Costa Rica? Playa Hermosa is part of a group of beaches known as the Papagayo; Playas del Coco, Playa Hermosa, Playa Panama and Ocotal. 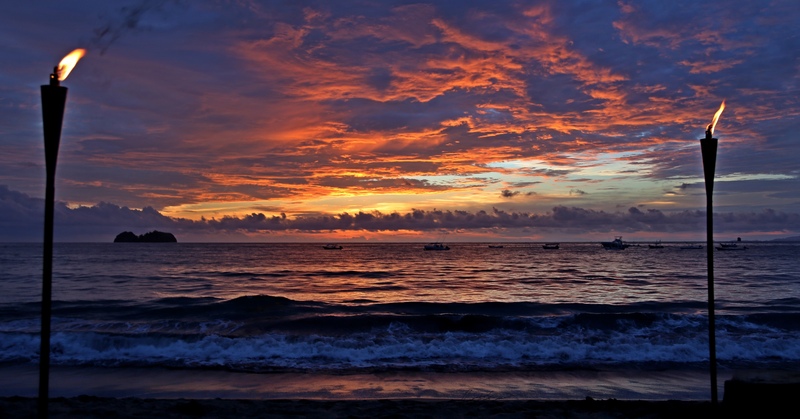 Located just 20 minutes from the Liberia International Airport (LIR) it is considered by many to be the most beautiful beach on the Pacific Coast. After all, Playa Hermosa means, BEAUTIFUL BEACH in Spanish, and it definitely lives up to its name. When I first came to Costa Rica in the year 2000, I spent a month traveling this entire country. I saw literally, every single beach community on the Pacific coast. When I landed in Playa Hermosa, I knew I needed to look no further. It was everything I had imagined and more. I had this vision of Jimmy Buffett, in a hammock, with a cocktail in my hand, watching the sunset, and this was the perfect spot to fulfill that dream. Most of the beaches in Costa Rica are wild, surfing beaches, with huge waves and strong undertow. It is very dangerous to go in the water, as the currents can be violent and aggressive. Not Playa Hermosa. 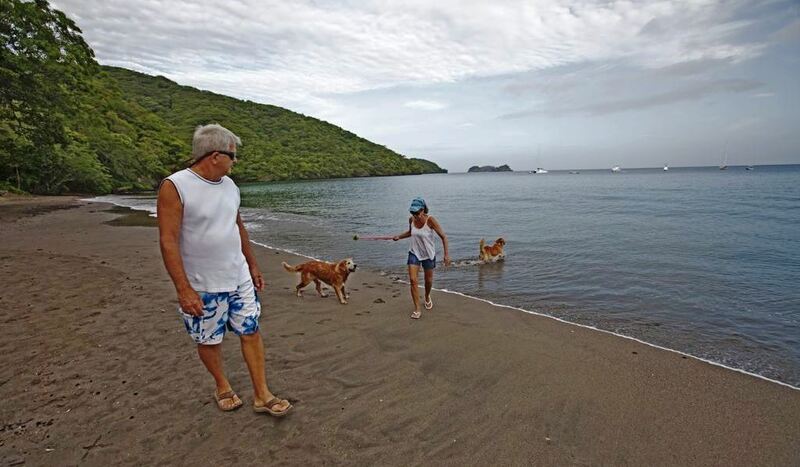 Frommer’s travel guide ranks it as one of the best swimming beaches in the country making it a great place for families and older retirees as well. You don’t have to worry about a rogue wave, slamming you to the sand, face planting you down and then sucking you back out to sea. Small children frolic in the surf, with no concerns for their safety. The horseshoe bay is one of the most tranquil places on this earth; very calm and protective, and there are two huge peninsulas, one on each side. These massive rock “fingers” protrude out into the Papagayo Bay, creating a very private, intimate and romantic setting. There is incredible snorkeling on the south end of Hermosa, as there is a little private cove that forms by the rocks. The north end has some fun pools to play in, created by the volcanic formations. The beach itself is lighter sand than many places, similar to California. There are huge palms and lush forested indigenous trees, which keep it looking just like it did hundreds of years ago. The “canopy” as we call it, always stays green, even in the dry season, as these Guanacaste trees and others have access to the water table below. Since the bay faces west to southwest, you can be assured to see a sunset every single night. WOW, they will blow you away. Playa Hermosa itself was never a town, so there is not a “strip” or an “avenue” like other beaches. It was originally owned by just a couple families, who made their living fishing the bay. Even after selling much of their land years ago, most of the original clan still occupy many of the homes near the beach. Their sons and grandsons now, are the Pescadores you see every morning, picking up the tourists and taking them out to sea. Because the bay is so smooth, dozens of fishing boats are just moored to the anchor below, creating a very scenic photo op. It is a very easy beach for boat entry, as they can literally come right up to the sand to pick you up. All the water sports are here; from sailing to scuba; kayaks and stand up paddle boards; jet skis and banana boats. There are also 6 or 8 massage therapists on the beach at any given time, just waiting to give you that relaxing rub down, as the waves go swoosh in the background. One day I was having breakfast, enjoying the morning breeze. A Polish client of mine from Chicago walked by with a rod and reel, and a tackle box in hand. “Going out on a boat?” I asked. “Nope; just waist deep” he replied. Right! I thought; good luck and I chuckled. I am not kidding you when I tell you; he was back before I finished my eggs. He had a 3 foot long Dorado (Mahi Mahi) and a smile just as wide. “Have a great day” he shouted, as I choked on a piece of bacon. Mother Nature did one heck of a job when she formed this pristine cove. 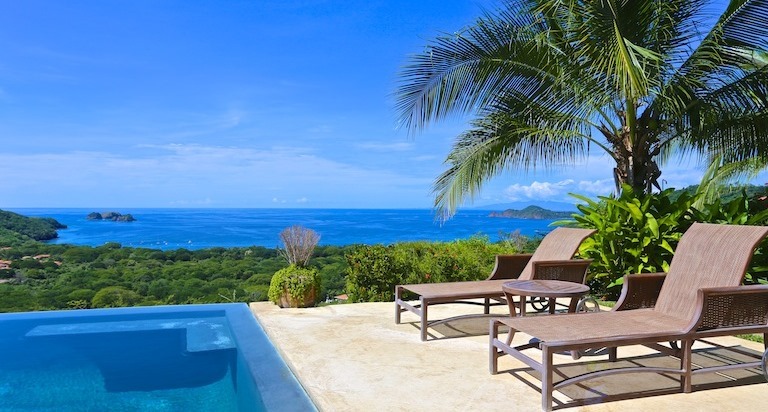 There are huge, towering mountains that seem to hover over the bay, allowing for some of the most spectacular ocean view property in the world. From these ridges, you can see the white water of the ocean bubbling up below. In the distance, a mile or so is the world famous Four Seasons hotel and Peninsula Papagayo. Monkey head rock, as well as the Argentina islands, seems so close you can reach out and touch them. From some vantage points, you can see the Playas del Coco bay, Playa Panama or the Papagayo Marina and the Hyatt Andaz. Many locations also have views of Rincon de la Vieja, Monte Verde and Tenorio Volcanoes, and the entire Santa Rosa National Park mountain range acts as a backdrop. On a crystal clear day, Witches’ Rock, the famous white boulder surf spot, is about the size of a thumbnail, all by itself, miles out in the Gulfo de Papagayo. Certain times of the year, you might see whales chilling in the bay, nursing their calves, soaking up the sun. Having lived in Southern California, it reminded me of Dana Point and Laguna Hills the first time I saw it, and I knew the types of homes that would someday be built on these peaks. Today, some of the largest, most inspiring and breathtaking homes dot these hills now. Personally, I call this the Malibu of Costa Rica; yet you can buy or build a home here for about 1/10th of what it would cost back there. But as the secret gets out, this won’t stay that way forever. In my opinion, this will be some of the most expensive real estate south of Texas in the next decade or two; similar to Hawaii. 30 years ago, Claude and his wife Sylvie, came here with their life savings. It was just a cow pasture then really, but they had a vision and planned to create something extraordinary. They built a small hotel, called Villa del Sueno, and were one of the first to bring tourists to this paradise. The road to Coco was a dirt trail then, and you could only go over the mountain with a jeep. They would drive the 30-minute muddy track, to pick up the few adventurers who made it this far on the bus and bring them back over the hill. As the word got out, more and more of us started to show up. 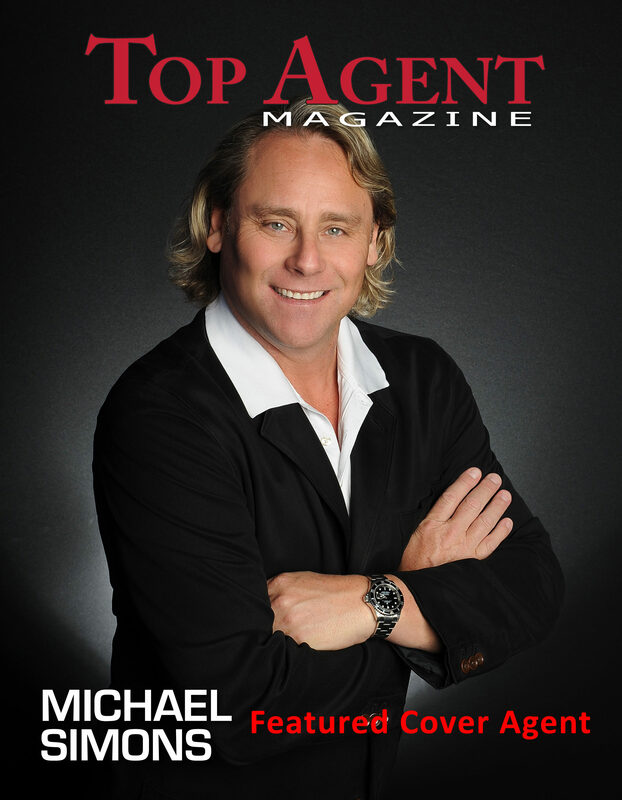 Within time, ocean view lots and small condominiums started popping up, and it became the stunning colony it is today. Claude is still called the Mayor of Hermosa to this day. Many people refer to Playa Hermosa as the suburbs LOL. It is a residential neighborhood, made up of about a dozen gated communities. Yet it feels almost like one big master planned development, as everything ebbs and flows together nicely. It is truly magnificent. 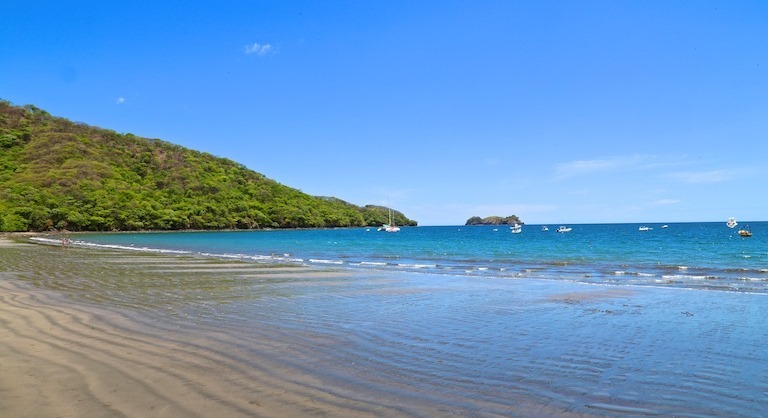 The residents here are mostly Expat retirees and affluent Costa Ricans who own a second home at the beach. It is a very quiet area, and the sidewalks roll up at about 10 pm. People love living here, because you are close enough to the action and the town of Coco, as it is just 8 minutes away that you can easily get to the bars to party. Yet you are far enough away from the hustle and bustle, that you feel like you are in a completely different world. Proximity to services, yet enough distance for tranquility. We even have our own Playa Hermosa Resident’s Association, which takes care of the beaches and picks up the trash from the side of the road, and works to improve the local school, parks, soccer field as well as helping with the construction of the monkey bridges, that keep our little friends off the high voltage wires. Every morning, dozens of residents can be found, getting their daily exercise walking the one-kilometer stretch; back and forth; back and forth. It is a dog lover’s paradise too, as so many of them are tagging closely behind their owners; tails wagging; tongues panting; covered in salt and sand. There are 6 restaurants on the beachfront making it a perfect spot for a cup of coffee and breakfast, at places like Bosque del Mar and El Velero Hotels. Around 5 PM every day, the gringos make the trek down the mountain, for a happy hour cocktail (or 5) at one of their favorite hangouts, including Aqua Sport, Roberto’s and La Casita del Marisco. With their toes in the sand and a drink in their hands, they take in the most superb sunsets you have ever witnessed in your life. It is a very social beach, in a soothing, pleasant way. As the stars come out and the moon starts to shine, this is a very popular spot for a romantic cuddle with your honey. In the afternoons and on the weekends, local families come to this spot, for volleyball or soccer and a picnic with their loved ones, as the Association has put down many tables, benches, and even a small playground. There is one main road through Hermosa, with two small feeders, going down to the beach; you cannot get lost. Some of the best restaurants in Guanacaste are in this little haven, including the world famous Ginger and Villa del Sueno hotel. There is also a killer Italian Pizza spot called Bocelli’s, named after the famous singer. We have an outstanding movie theatre The Beach Cinema, which plays first-run flicks; a very comfy setting in an adorable little strip mall. There are Amy’s rocking hair salon and spa there, as well as my favorite locale to haunt, SANDBAR Bistro Pub and Sports Bar; which is the one late night spot to hang. There is what I call, survivor commercial, as we have a small Luperon Grocery store and a Pharmacy, as well as a Dental office, souvenir boutique, and a Scuba shop. There is even an outdoor Amphitheatre, which brings in some very well-known acts. Let’s not forget either; Playa Hermosa is home to the Number One Real Estate Company on this earth: RE/MAX TRES AMIGOS. In the mid-1980’s a couple from Montreal decided to sail around the world on their sailboat. They worked their way down the USA coast and into the islands of the Caribbean. They spent months stopping at every Port of Call they could, seeing some of the most unbelievable places on God’s blue oceans. They continued down and through the Panama Canal, and worked their way up the Pacific Coast of Costa Rica. When they arrived in Playa Hermosa, they said it was the most sensational, awesome place they had ever put their eyes on; they called it heavenly, and they had just played Pirates of the Caribbean for the last 12 months. They moored their craft and walked up on to the beach, and there was a little house for sale. They bought it and called it the El Velero B&B (The Sailboat B&B). Over the next decade, they expanded it into a 22 room boutique hotel on the beach that is still there to this day. The El Velero hotel, known as my second office, will always have a special place in my heart. It was here, over a bottle of vodka with the new owner Big Mike that I made the life-changing decision to sell everything I had, and move to paradise. By the way, the original builder, Jean Pierre, is still here today. It happened to all of us. We came, we saw, we fell in love: and we will NEVER leave. Hope you can join us.